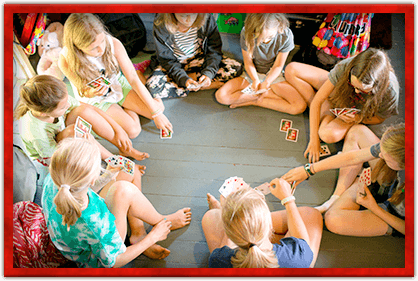 girls summer camp Archives - Lochearn Summer Camp for Girls - Our Girls Sleepaway Camp Blog! Coming to camp gives you the opportunity to learn all about yourself. You not only learn skills like how to shoot a bow and arrow or make a mug in ceramics, but you also learn communication and independence — things that will stick with you long after the final sunset of summer. Whether you’re a first-time camper or a Lochearn veteran, there are always plenty of new faces on the first day of camp. One of the best parts of summer is creating relationships with campers and staff members while practicing good decision making and discovering how to be independent. There’s so much to learn about yourself and the world around you, and we encourage stepping out of your comfort zone to get the best Lochearn experience. Campers and staff come from 20 countries around the world to spend the summer in Vermont at Lochearn. It’s easy to fit into our close-knit community of nice girls. 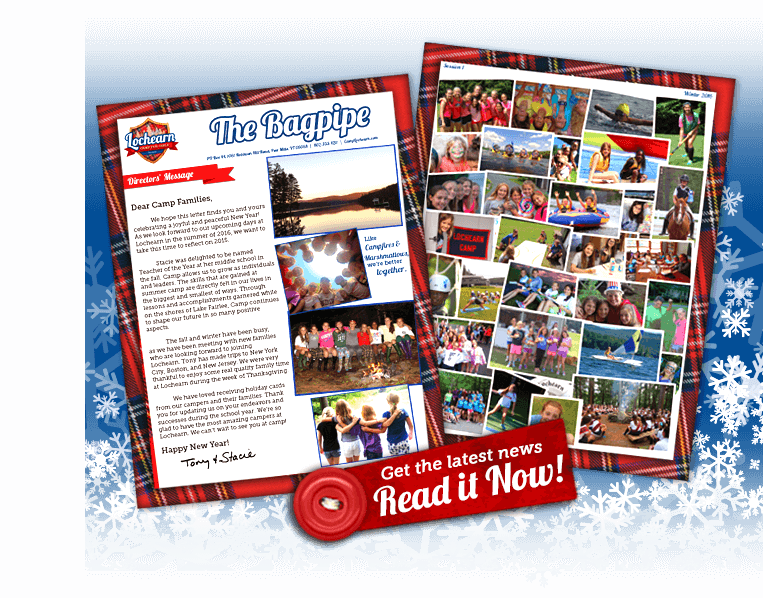 Through the good times and the bad, you know there will always be a Lochearn Lassie somewhere who will be there for you year-round, whether you’re at camp or back at home. We grow together over the course of camp, celebrating each person’s uniqueness and encouraging one another to strive to be our best. 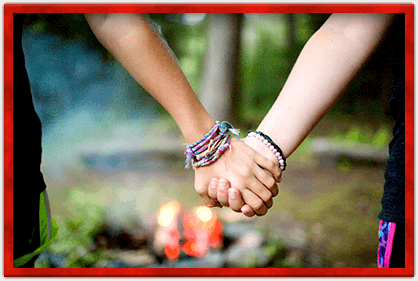 And when summer comes to an end, we know we’re not saying goodbye for good, because camp friends are for life. Lochearn’s lakefront cabins and welcoming facilities provide the perfect backdrop for all of the wonderful memories made at camp. It’s easy to call beautiful Vermont your home away from home. Your Lochearn memories are different than any memories made at home or while traveling elsewhere because you can be totally you, no matter how silly or spunky you are. Plus, you’re unplugged. Instead of worrying about posting on social media, texting or Snapchatting photos, we focus on being in the moment and communicating face-to-face. 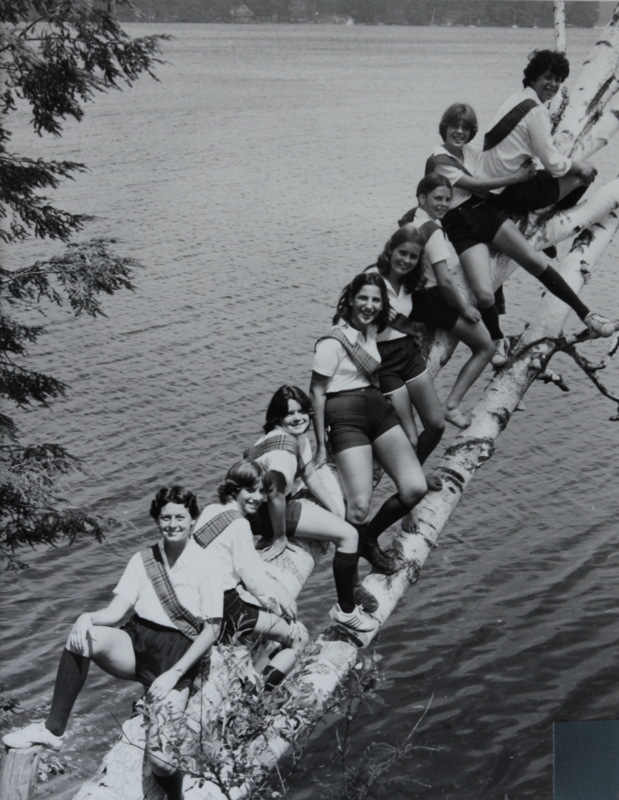 As we saw from generations of Lochearn Lassies last summer during our 100th year celebrations, your camp memories truly stay with you for a lifetime. We’re just under seven months from opening day, and we couldn’t be more excited! Knowing you’ve always got somewhere to come back to is such a cool part of Lochearn, because your favorite things will still be the same, but you’ll be a year older. You experience things in a different way year to year and can set new camp goals for each summer. Maybe this will be the summer you finally earn a purple in gymnastics or work up the courage to try wakeboarding for the first time. And if not this year, you know you’re always welcome back for the summers to come. This entry was posted in Uncategorized and tagged 100 years, camp for girls, Camp Lochearn, girls summer camp, lochearn, Lochearn Lassies, Thankful, Thanksgiving, vermont camp for girls, Vermont Summer Camp, Why we are thankful on November 14, 2016 by Lochearn Admin. 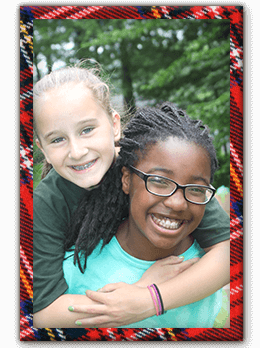 This entry was posted in Newsletter and tagged camp for girls, Camp Lochearn, girls camp, girls summer camp, Vermont Summer Camp on October 11, 2016 by Lochearn Admin. We hope all of you are enjoying the start of spring. Change in seasons reminds us that summer is right around the corner. The summer of 2016 will be here before we know it! Winter flew by as Tony met with new camp families throughout the country from New England and Greater New York to South Florida, Southern California and many cities in between. We are so excited for new campers to join us for an amazing summer in Vermont! Thank you to the O’Connor Family who hosted the Lochearn Winter Gathering in February. It was wonderful seeing so many campers, CTs, and parents at the O’Connor home in New Canaan, Connecticut. We greatly enjoyed hosting the annual Spring Summit at the winter office in Gainesville, Florida. As a leadership team, we reflected on the successes of 2015, and looked at what we can do to make Lochearn even stronger this summer. It always goes back to our amazing campers and how honored we are to have the opportunity each year to watch our campers grow. looking forward to Lochearn Alumni joining us to tell stories and to sing our favorite Lochearn songs on campfire hill. As a camp, we will celebrate Lochearn’s 100th birthday throughout each session. This summer is sure to be a special one that we will all remember for years and years to come. We are thrilled that many of our instructional and support staff are returning for another great summer. We can’t wait to see you in Vermont! 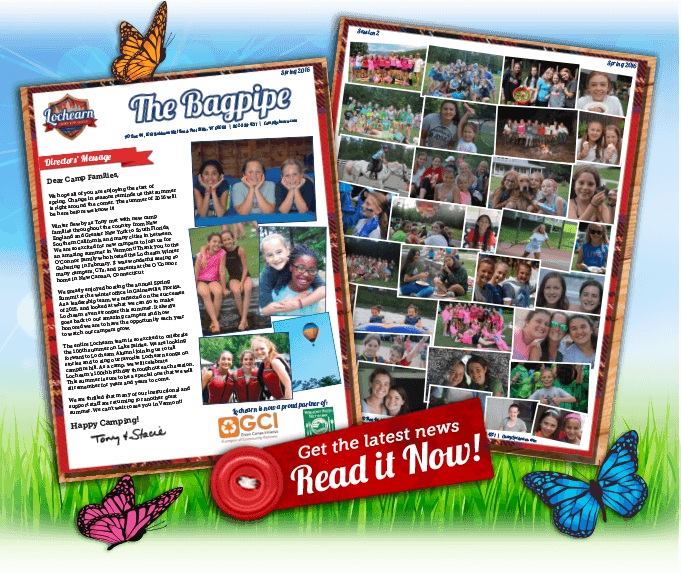 This entry was posted in Camp News and tagged 100th anniversary, camp for girls, Camp Lochearn, Directors' Message, girls summer camp, lochearn, Lochearn Camp for Girls, Vermont girls summer camp, Vermont Summer Camp on May 2, 2016 by Lochearn Admin. This entry was posted in Newsletter and tagged camp for girls, Camp Lochearn, girls camp, girls summer camp, Vermont Summer Camp on April 25, 2016 by Lochearn Admin. We hope this letter finds you and yours celebrating a joyful and peaceful New Year! As we look forward to our upcoming days at Lochearn in the summer of 2016, we want to take this time to reflect on 2015. Stacie was delighted to be named Teacher of the Year at her middle school in the fall. Camp allows us to grow as individuals and leaders. The skills that are gained at summer camp are directly felt in our lives in the biggest and smallest of ways. 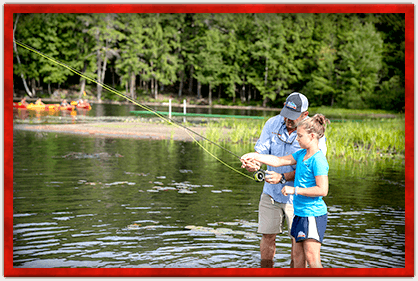 Through lessons and accomplishments garnered while on the shores of Lake Fairlee, Camp continues to shape our future in so many positive aspects. The fall and winter have been busy, as we have been meeting with new families who are looking forward to joining Lochearn. Tony has made trips to New York City, Boston, and New Jersey. We were very thankful to enjoy some real quality family time at Lochearn during the week of Thanksgiving. We have loved receiving holiday cards from our campers and their families. Thank you for updating us on your endeavors and successes during the school year. We’re so glad to have the most amazing campers at Lochearn. We can’t wait to see you at camp! This entry was posted in Camp News and tagged camp for girls, Camp Lochearn, girls summer camp, Vermont Summer Camp on January 18, 2016 by Lochearn Admin. This entry was posted in Newsletter and tagged camp for girls, Camp Lochearn, girls camp, girls summer camp, Vermont Summer Camp on January 11, 2016 by Lochearn Admin. As the sun sets on Summer Camp 2015, Lochearn’s 99th year, we’d like to take a moment to thank our campers, parents, and staff. Thank you for your continued support and for another wonderful summer. Cheers of “How do you feel?” still resonate through our heads as we reflect on our time on Lake Fairlee together. Sunday night campfires continued to be a time when important life lessons and personal triumphs filled our hearts and minds with a “deeper understanding of the beauty about us.” Alumnae delighted us with their visits and made these moments even more complete as they shared their favorite memories from the decades of Lady Lochearn. Our tennis and riding programs topped the list in terms of quality instruction. “We are jogging” became a favorite way to greet each other around camp. The arts continued to shine with beautiful ceramics and bracelets, and our productions of Annie showcased the girls’ theatrical talent. This entry was posted in Camp News and tagged camp for girls, Camp Lochearn, girls summer camp, Vermont Summer Camp on October 16, 2015 by Lochearn Admin. 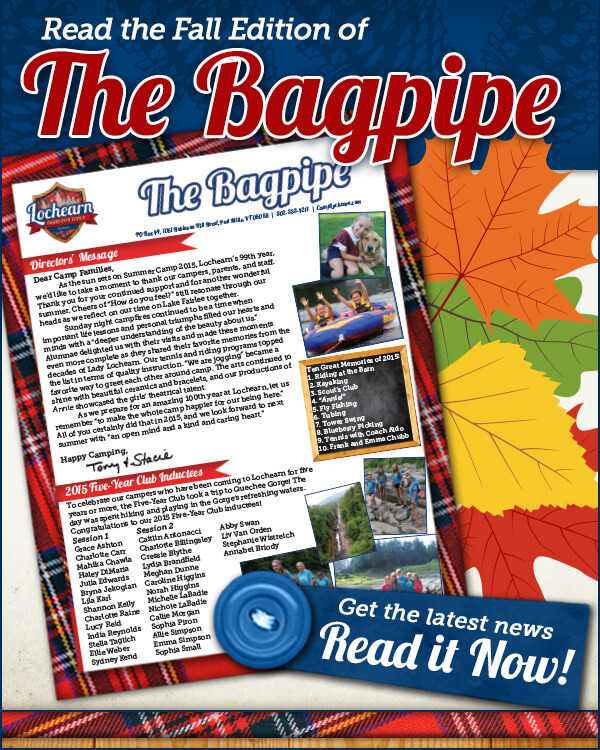 This entry was posted in Newsletter and tagged camp for girls, Camp Lochearn, girls camp, girls summer camp, vermont camp on October 9, 2015 by Lochearn Admin. 2016 marks the 100th Year since Lochearn’s establishment on the shores of Lake Fairlee. Alumnae can stay up-to-date on all that is happening and connect with camp friends and cabin mates by registering in our Alumni Guestbook. Visit the Guestbook today and let us know when you attended or worked at Lochearn and what you’re up to! We will begin planning for the 100th Year Anniversary in the Fall and want to make sure our alumnae are involved and in the loop. Thank you! 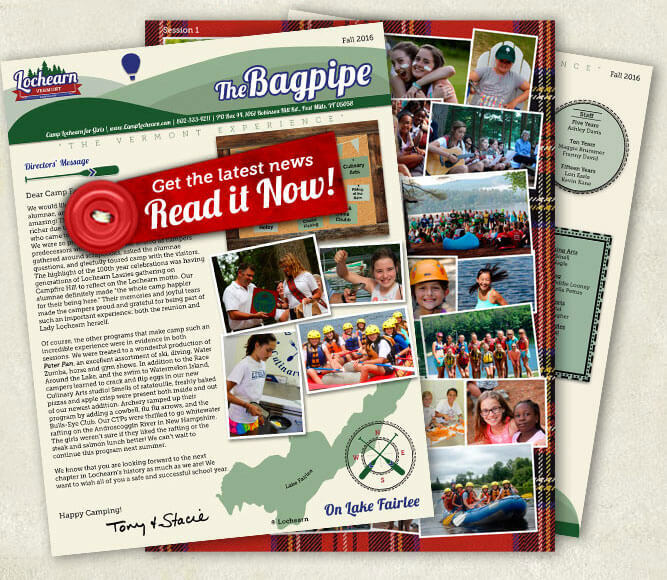 This entry was posted in Camp News and tagged alumnae, Camp Lochearn, girls summer camp, Lochearn Alumnae, vermont camp on June 22, 2015 by Lochearn Admin. We are proud to welcome Aldo Santiago from Mount Holyoke, an all-girls college, join our staff this summer as the Head of Tennis! Aldo has 22 years of head coach experience at Mount Holyoke College, where he has coached two nationally ranked players, a NEWMAC Player of the Year and three NEWMAC Rookies of the Year. We are lucky to have a leader with such a high caliber of coaching and an inspiration to teach beginners and help experienced campers reach a new level of play. Aldo truly believes in motivating young women to foster a passion and life-long love for tennis. 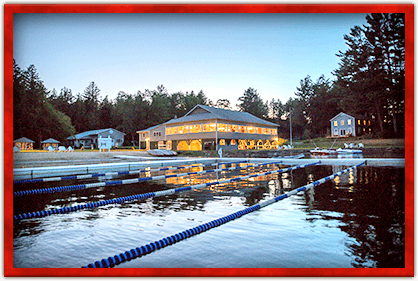 This entry was posted in Camp News and tagged camp for girls, Camp Lochearn, girls summer camp, tennis, Vermont Summer Camp on June 15, 2015 by Lochearn Admin.